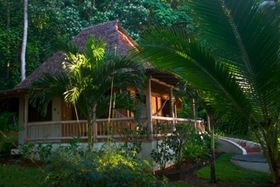 The lodge is nestled among 150 acres of tropical wilderness. 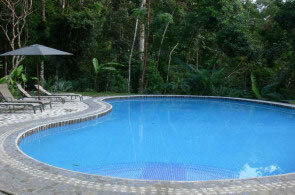 Over 75 acres of the lodge’s property is primary virgin rainforest. You can spot literally hundreds of rare and beautiful bird species such as the scarlet macaw, red-legged honeycreeper, and slaty-tailed trogon. You will also likely encounter exotic creatures, such as coatis, tayras, and the four species of monkeys found in Costa Rica. There are year-round waterfalls on the property, one with a swift flowing chute and refreshing wading pool less than a ten minute walk from the bungalows. 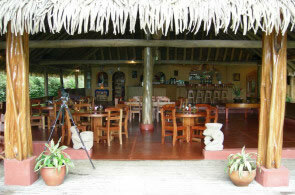 The rancho houses the restaurant, bar, kitchen, reception, library, and gift shop. The dimensions of the structure reflect those of the surrounding rainforest, with a towering roof soaring 25 feet over one of the largest ranchos on the Osa Peninsula. 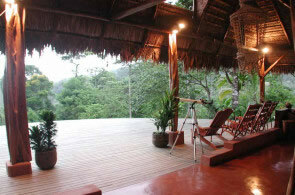 The spacious deck is ideal for bird watching, stargazing, or just absorbing the energy of the rainforest.Secluded in a beautiful garden alongside the rancho rests a natural rock encrested pool perfect for sunbathing, cooling off from a vigorous tour, or just sitting and enjoying one of the most beautiful vistas in the world.